During the past three decades, US federal land management agencies have worked to enhance the public’s connection with the outdoors for purposes of recreation, renewal, improved health, and high-quality time spent with family and friends. Providing and managing for these opportunities is fundamental to the stewardship missions of these federal agencies. At the same time, these agencies are challenged to strike an appropriate balance between societal benefits and resource protection and conservation. Managing visitor access and use for recreational benefits and resource protection is inherently complex. 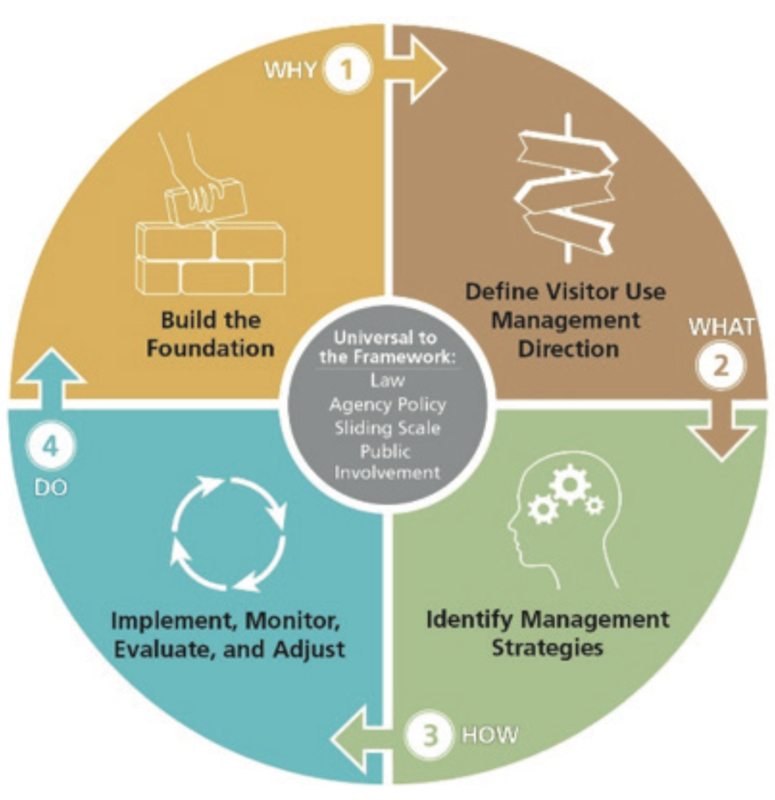 In July 2016 the Interagency Visitor Use Management Council (Council/IVUMC) released the first edition of the Visitor Use Management Framework (Framework). The Framework outlines a planning and decision-making process for managing visitor use across the US federal lands and waters. This work is important because visitor use management is fundamental for achieving and maintaining desired visitor experiences and resource conditions. The Framework provides a flexible process for managing visitor use on federally managed lands and waters that can be incorporated, as appropriate, into existing agency planning and decision-making processes. The Framework also helps communicate to researchers, educators, and stakeholders the process by which agencies manage visitor use. The Framework also helps communicate to researchers design studies that answer critical visitor use management questions and should help educators prepare the next generation of land managers. The Framework builds on lessons learned from previous approaches (e.g. Limits of Acceptable Change and the Visitor Experience and Resources Protection Framework) and is shared by the six agencies that are part of the IVUMC. This article provides an overview of the Visitor Use Management Framework as well as discusses its potential utility for managers and researchers of protected lands and waters. The Framework enhances consistency in visitor use management on federally managed lands and waters. The Framework’s elements are broadly applicable to all visitor use management opportunities and issues, including a wide spectrum of situations that vary in spatial extent and complexity. More specifically, the Framework may be used as part of a general or comprehensive planning effort, which typically provides overall guidance on desired conditions, appropriate uses, and general management strategies for different areas within a unit. The Framework may also be used to guide project- level planning and management, which typically define actions for specific areas. It may also be used across a series of projects that build on each other and may be applied to internally driven activities (e.g., analyzing a management action), as well as externally driven activities (e.g., a permit request or an action by another agency). The Interagency Visitor Use Management Council consists of representatives from six federal agencies, including the Bureau of Land Management, National Park Service, US Fish and Wildlife Service (US Department of the Interior), Forest Service (US Department of Agriculture), National Oceanic and Atmospheric Administration (US Department of Commerce), and US Army Corps of Engineers (US Department of Defense). The Council’s mission is to provide guidance on visitor use management policies and to develop legally defensible and effective implementation tools for visitor use management. The Council’s primary purpose is to (1) develop interagency guidance for effective visitor use management programs that are efficient and legally defensible; (2) identify strategies for improving institutional capabilities and professional competencies, including partnerships; (3) develop shared tools and training, including a unified visitor use planning framework, and monitor their effectiveness, and (4) improve internal and external communication strategies. Visitor use management is fundamental for maximizing benefits for visitors while achieving and maintaining desired resource conditions and visitor experiences on federally managed lands and waters. 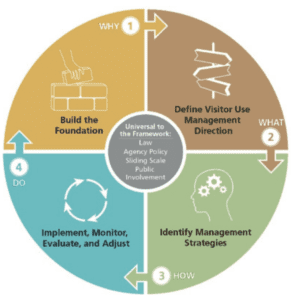 By using this Visitor Use Management Framework, managers collaboratively develop long-term strategies for providing access, connecting visitors to key visitor experiences, protecting resources, and managing visitor use. The purpose of the Framework is to provide cohesive guidance on four major elements (Build the Foundation; Define Visitor Use Management Direction; Identify Management Strategies; Implement, Monitor, Evaluate, and Adjust) for analyzing and managing visitor use on federally managed lands and waters. It is also intended to provide a legally defensible, trans- parent decision-making process that meets law and policy requirements, ensures agency accountability, and provides sound rationales on which to base management decisions and actions. Overall, this Framework is meant to be adaptable to different agencies’ policies and regulations and yet allow for a professional, comprehensive, and consistent approach to visitor use management on federally managed lands and waters. The concepts presented in this Framework are not new; it is the product of an evolution of earlier efforts, modified to reflect lessons learned. It follows all of the Council agencies’ planning principles and illustrates how to specifically address visitor use management. It is consistent with previous efforts, such as the Limits of Acceptable Change process and the Visitor Experience and Resource Protection Framework. In particular, one of the goals of this Framework is to avoid the limitations of previous frameworks (e.g., limited to specific federal agencies, overly complex and costly, perceived as reactive). This Framework is designed to be highly flexible and adaptable to local situations and needs. Of particular importance is the notion of a sliding scale of analysis, whereby the investment of time, money, and other resources in the analysis is commensurate with the complexity of the project and the consequences of the decision. Issues with clearly small impacts usually require less depth and breadth of analysis than those with impacts of greater significance. This framework was designed to be applicable to a wide range of projects. For some projects, one person might work through the framework to a decision in a few hours; other projects might require multiple years of work by large teams. The Framework acknowledges that there are a variety of factors that influence where a visitor use management issue or plan lands on the sliding scale. These factors include the level of uncertainty about the issue, risk of impacts to resources and visitor experiences, degree of stakeholder interest, and level of controversy/potential for litigation. The Framework includes a decision support tool to help framework users evaluate their issues and projects to better understand the appropriate level of analysis for their plan or project. Define visitor use management direction. These represent the most basic and critical elements for successfully managing visitor use. In many cases, these basic elements are applicable across the entire breadth of visitor use management projects, regardless of agency. Each element includes steps that provide more detailed direction on the various management topics that support their achievement (see Figure 2). Finally, several concepts are universal to the implementation of the Framework, including application of law, agency policy, the sliding scale, and public involvement. It is important to note that although presented in a linear order, these elements and steps are highly iterative in nature. As noted previously, this Framework is intended to be applied in a flexible manner using the sliding scale concept. The strengths of this Framework are that it is iterative, adaptable, and flexible. Building the foundation is the first of the four elements of the Framework. The purpose of this element is to understand why a project is relevant and how best to approach the project. The steps in this element help managers understand what needs to be done, how to organize the project, and how to define the resources needed to complete the project. They use the sliding scale to determine the amount of effort needed for the steps in this element. Major steps include clarifying the purpose and need of the project; reviewing the area’s purpose and reviewing establishing legislation, agency policies, and other management direction; assessing and summarizing existing information and current conditions; and developing a project action plan, including a plan for outreach and public involvement. Completion of this element establishes a foundation for the other three elements of the Framework and is a key component in developing a solid process. The purpose of this element is to answer the questions: What are we trying to achieve, and what will indicate that we’ve been successful in our management over time? Completion of steps in this element constitutes “visitor use management direction.” This direction may be developed as part of a programmatic document (e.g., general management plan, resource management plan) or may be more fully developed as part of a plan for a specific resource or activity (e.g., wilderness management plan). Developing this direction is not a stand-alone process but rather is embedded within appropriate agency planning guidance for managing recreation or visitor use, including NEPA compliance and public involvement. Well-defined visitor use management direction communicates a positive vision for the future, provides a clear link for future management actions, and guards against incremental or haphazard change. With clear understanding about the conditions to be achieved, the choice and purpose of management actions is more evident. This helps to ensure that areas are managed by design, not default. The purpose of this element is to answer the question: How will visitor use be managed to achieve or maintain desired conditions? This element is intended to help managers identify management strategies and actions to achieve and maintain the desired conditions of a project area. Management strategies are general approaches of addressing visitor use management issues, while actions are specific ways of implementing management strategies. This element also describes the identification of a visitor capacity and implementation plans for that capacity. Visitor capacity is a component of visitor use management and is defined by the IVUMC as the maximum amounts and types of visitor use that an area can accommodate while achieving and maintaining the desired resource conditions and visitor experiences that are consistent with the purposes for which the area was established. The purpose of this element is to answer the questions: How will management actions be implemented, and when are adjustments made based on lessons learned? Monitoring aids a learning-based approach in which the more that is known, the better staff can manage for desired conditions. The steps in this element show a process for implementing management actions, monitoring those actions, evaluating monitoring results, and making adjustments to management strategies and actions based on monitoring results. The work in this section builds on previous steps and allows managers to evaluate current conditions compared to the desired conditions as related to results of monitoring indicators. During this final section of the Framework, all the planning and decision-making is put into action. The approach to implementation and monitoring outlined here prompts managers to take action to achieve desired conditions and monitor and adapt those actions to ensure that the current conditions are consistent with desired conditions. Before the release of the Framework, the Council released two position papers on topics key to visitor use management. These position papers document the council’s position on key components of visitor use management and provide guidance for policy development. This paper defined visitor use management and visitor capacity, clarified how these two concepts interrelate, and outlined how these concepts should be used by managers of federal lands and waters to meet agency goals. The purpose of this position paper was to document the Council’s position on and recommendations for addressing visitor capacity generally, and specifically in accordance with the visitor capacity requirements found in the Wild and Scenic Rivers Act, National Trails System Act, and National Parks and Recreation Act. The IVUMC is currently developing several companion publications and resources to support the Framework and provide additional guidance on key elements. These products are currently under development and review by the Council and are due to be released and available for use in 2017 or early 2018. The indicators, thresholds, and monitoring guidebook focuses on determining acceptable levels of impact from visitor use, providing guidance on developing a monitoring strategy, and using information derived from monitoring thresholds to evaluate management actions. Throughout this guidebook, the sliding scale approach is discussed, whereby the degree of precision and amount of investment in establishing thresholds and conducting monitoring is appropriate to the consequences of the potential decisions to be made about managing visitor use. This guidebook provides a step- by-step process or “how-to,” guiding the process of identifying visitor capacity as well as potential management strategies to manage the amount of visitor use within the identified capacity. Additionally, the guidebook contains case study examples, an overview of the concept of visitor capacity, and three papers on the relationship between impact and amount of use, including environmental impacts, human- wildlife conflicts, and social impacts. The how-to portion of the guidebook is intended to provide managers with the tools necessary to identify visitor capacity, when necessary and appropriate. The case studies provide examples of a variety of parks and protected areas where visitor capacity has been identified as necessary and appropriate and walks the reader through the steps, highlighting nuances of each area. The council is developing a training curriculum that serves diverse audiences. This series of courses is designed to provide an introduction to the Council’s Visitor Use Management Framework. The training series will offer the opportunity to engage in learning about the Framework through specific courses and engage with the content in a way that applies meaningful context for those interested in learning more about how specifically to address visitor use management issues using the Framework. The Framework and its companion publications and resources provide a science-based visitor use management toolbox for land managers and other outdoor recreation professionals. The Visitor Use Management Framework, Edition One provides a flexible process for managing visitor use and is applicable across a wide spectrum of management situations that vary in spatial extent and complexity. As these tools are integrated into the agencies’ best practices and policies as well as project applications, it will notably increase consistency of process and product outcomes for managing use on federally managed lands and waters. The Visitor Use Management Framework, Edition One, as well as other IVUMC product and publications can be found on the Council’s website: http://visitorusemanagement. nps.gov/VUM/Framework. Please note that the Framework is a dynamic document, and the Council intends to have future editions as lessons learned are collected from continued implementation. INTERAGENCY VISITOR USE MANAGEMENT COUNCIL is designed to increase awareness of and commitment to proactive, professional, and science- based visitor use management on federally managed lands and waters; https://visitorusemanagement.nps.gov/.